There’s no doubt that New York City has an incredible skyline. 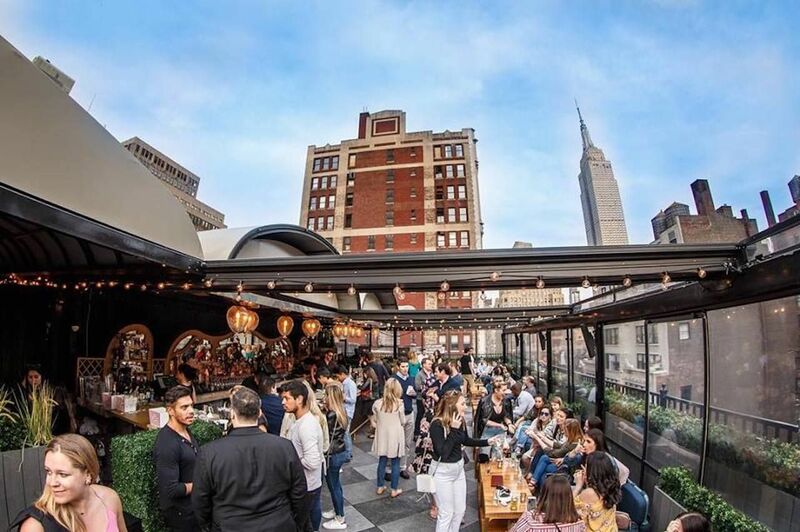 Many visitors think that their only chance to see sweeping views is by forking out tons of money to go to the Top of the Rock, the Empire State Building, or One World Observatory, but rooftop bars are actually just as amazing of experiences — plus you get to drink. Far from being just a summer treat, though, there are many enclosed rooftop bars you can enjoy in brisk fall weather and even chilly winter. 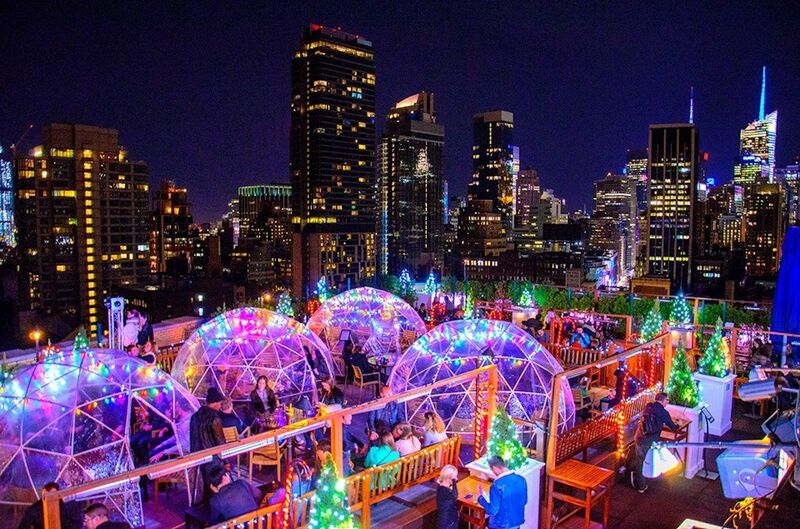 Here are the six best enclosed rooftop bars in Manhattan. 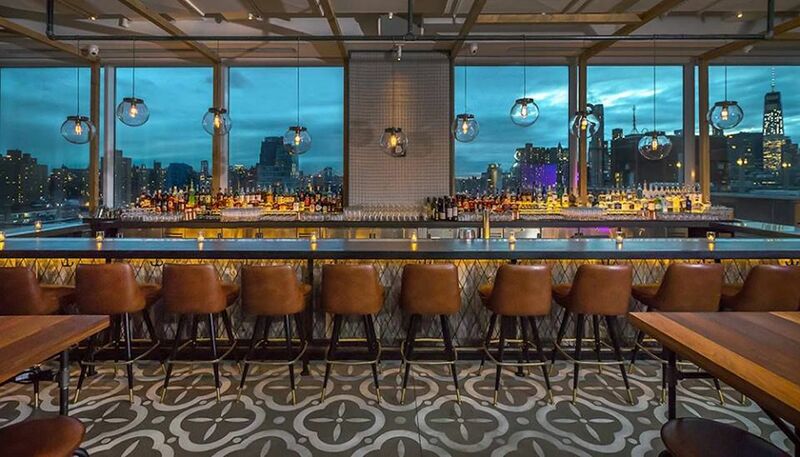 You’ll find one of the best views of the city at the Standard Hotel’s Le Bain. Take note: You’ll have to dress up a bit and wait in line to get in here, but it’s definitely worth it. After a bouncer counts off how many are in your group, you’ll walk through a hall with glow-in-the-dark figures on the walls then get into an elevator — the very same one where an infamous celebrity incident took place. It’ll drop you off at the indoor, Gatsby-like part of the bar, complete with a pool filled with beach balls in the center of the room and disco balls hanging overhead. Walking up a flight of stairs will take you to the outdoor part where there’s fake grass, lawn chairs, and a crepe counter. Shoulder-height glass walls provide you with a safe, amazing view of lower Manhattan, the Hudson River, and part of New Jersey. The McKittrick Hotel is best known for the immersive experience found in its walls, titled “Sleep No More.” However, on the rooftop is an oasis you’d never expect in such an urban city. The pebbled path is decorated with trellises interlaced with greenery, leading you up to a garden-like setup with potted plants all around, wooden tables and chairs, and views of the West Side. It’s like being at a park without dealing with all of the bugs — and you get to legally drink. You can get the usual variety of drinks here, but the bar has several cocktails inspired by the show, such as the Sleep No More and White Widow. Drinks start being served around 5:00 PM on weekdays and from 11:00 AM on weekends. Weekend brunch here is $39 per person, buffet-style and with live entertainment. Sundays are “Hot Jazz Sunset Sundays,” during which live jazz plays at sunset to get you to stop thinking about the fact that tomorrow’s Monday. Mr. Purple is chic and trendy, fitting right in with the Lower East Side vibe. The bar and restaurant stretches out across multiple areas, providing so much space that you’ll never feel crowded no matter where you choose to post up. There’s an indoor lounge area, two terraces (one with purple furniture to go with the bar’s moniker), and an outdoor swimming pool. Seating ranges from bar stools to garden chairs and a variety of sofas. The menu has a long list of spirits, craft brews, and wine, and it boasts fresh, locally sourced ingredients for both food and drink. Go for the signature Mr. Purple with Casamigos reposado tequila, cranberry liqueur, allspice dram, apple, and lemon. With rooftop bars, there’s always the potential to feel the cold, but 230 Fifth has taken care of that problem for you. It’s New York’s largest outdoor rooftop garden and fully enclosed penthouse lounge, with one floor being entirely enclosed. During the summer, the rooftop garden has large umbrellas to provide shade or shelter from any rain. But when you’ll really want to go is in the fall, when 230 Fifth puts up plastic igloo tents so that you can enjoy the outdoors without freezing. There are 17 heated igloos available, each providing an intimate experience where you can enjoy your time there with friends and strangers alike. Warm up with boozy hot chocolate, Irish coffee, or apple pie cider with vodka while you get an incredibly close glamor shot of the Empire State Building and Midtown. Another Midtown favorite is Refinery Rooftop, atop the Refinery Hotel. The industrial-style decor, brick walls, and retractable glass ceiling act as a nod to the area’s background and building’s history as an old hat factory. Twinkling lights strung about make the open space feel ethereal though you can count on the drinks to keep you grounded. There are 10 signature cocktails, including the I Don’t Give A Fig and Yuzu Margarita, and five varieties of Old Fashioneds, some made with interesting ingredients, such as matcha and bacon. You don’t have to head out of town to satisfy your desire to visit an amusement park; you can do that right at Magic Hour. Part of the Moxy Hotel in Times Square, the rooftop bar and lounge calls itself an “urban amusement park,” and it certainly lives up to the name. There are five different spaces, each with its own distinctive vibe: the entrance hall, displaying animal statues in different positions; the indoor lounge, with an underground-party, industrial feel; the east side outdoor area, which overlooks the Empire State Building and has elegant fixtures; and the west side, with a rotating seating area that’ll make you feel like you’re on a carousel in the middle of a dance floor. But what contributes most to the idea of an urban amusement park is Magic Hour’s Foreplay, a miniature golf course where giant animals in suggestive poses are what you’ll be putting the ball around. The cocktails here are fun and innovative; some are named things like Float My Boat and We Were on a Break! Others are jumbo-sized, and some are served in a disco ball or a plastic pouch — but all taste delicious.